As some of my fellow travelers have commented already, the beautiful hilltop village of Altea is not a great place to go if you're looking for the wide beaches of golden sand which for which Spain's Costa Blanca is famous. In fact, Altea has been spared the mass-tourism of many other coastal towns for that exact reason. The closest thing you'll find to a beach in Altea is Playa de la Roda, a palm-lined pebble beach which runs along the seaside promenade. The beach is made up of (rather large) pebbles and stones though there are sandy spots as you move further back away from the water. If you're going to spend some time at Playa de la Roda, I'd suggest bringing shoes or sandals to make walking more comfortable and, if you can, a deck chair or lounge to save your poor vertebrae from the uncomfortable stones. 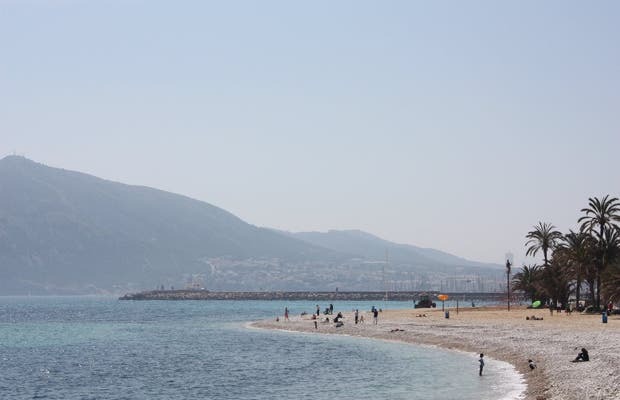 In any case, if you're looking for a larger and more comfortable pebble beach, the wonderful Playa del Albir is only a short walk down the coast in Alfaz del Pi. The beach at Altea La Roda is the main Blue Flag beach of this town on the Costa Blanca. Being a stone beach, it is always pretty quiet and peaceful, with almost no people. Its location is very convenient, as there is a parking area about fifty metres away and there are many bars and restaurants also within walking distance. There are showers and a Red Cross booth that handles surveillance.